Sanford, Florida – Sanford, Florida’s The Nutty Peanut, a small batch craft peanut butter company, is celebrating its one-year anniversary on National Peanut Butter Day, January 24, 2019. The Nutty Peanut makes healthy nut butters with all natural, vegan, and non-GMO ingredients. Each batch of peanut butter is super boosted with MCT oil to improve digestive and immune health, organic golden flax to promote healthy skin and lower cholesterol, organic goji berry powder to detoxify the liver and power your body with antioxidants, and pink Himalayan salt, which contains 80+ minerals and trace elements, to help balance your body’s pH levels. Jars of The Nutty Peanut’s nut butters are handmade just two at a time. Aside from their classic peanut butter (Plain Ol Nutty), The Nutty Peanut offers a wide variety of unique flavors, such as Cocoa Nutty Nana (chocolate banana peanut butter), Razzy Short Stack (raspberry pancake peanut butter), Wake Up Nutty (coffee peanut butter), Nutty SAM (sunflower seed, almond and maple sugar butter) and Wild Jungle Nutty. Wild Jungle Nutty, made from the rare wild jungle peanut, is the only peanut butter of its type produced in the United States and solely by The Nutty Peanut. 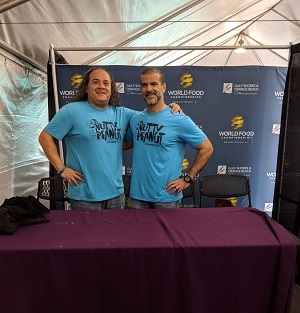 The Nutty Peanut, owned and operated by Mike Della Pia and Mick Rivera, is a super healthy, all natural, vegan, and non-GMO nut butter producer in Sanford, Florida. Their nuts are sourced from multiple locations to create a unique butter blend, and each jar is handmade two at a time. The “craft beer” of peanut butter, The Nutty Peanut was recently featured at the World Food Championships “Innovation Station” in Alabama on November 7-11, 2019.